I know a lot of people love to travel but don’t have the means or desire to stay in a hotel every night. For me, I would rather stretch my budget, sleep for free, and spend the extra money on fuel and food! I want to share a few things I have picked up on over the years and hope to hear some input from other members as well. Where and how you sleep depends a lot on what type of facilities you need. I am gearing this topic more towards those with a sleeping platform in the back of their vehicles and possibly those with a roof top tent or pop-top. Vehicles that do not draw attention will have the best success rate and most options available. The more obvious it is that you are camping, the less options you have. Over the years I have adopted a style of “urban camping”. I use to try to find quiet places away from people and out in nature. What this seemed to always lead to was being bothered in the middle of the night by someone wondering why I was there. Anywhere that you would draw attention is typically a bad place to camp. An isolated nature preserve with quiet parking might seem like a great place, but when security rolls through at midnight or the security cameras catch you or a nosy neighbor calls the police, they will wonder why a vehicle is in the lot when the place closes at 8pm. They will approach the vehicle for a look inside and try to determine if you are lost in the preserve or are kids doing drugs or something illegal. Even if you explain yourself and they allow you to stay, this is a hassle to be woken up in the middle of the night. Urban camping allows for undisturbed sleep because you blend in. You are in a spot where cars are expected to be and you don’t draw any attention. This doesn’t mean you need to be in a Wal-Mart parking lot. There are quiet places to go. Now, Wal-Mart has been mentioned. They have an open policy of allowing you to camp in their parking lots. They have bathrooms that you can use without being questioned, they are often open 24 hours, and you will not be bothered. Pick a spot out of the way and be respectful. Don’t make a mess in the parking lot or cause a scene and this policy will continue. I’ve often spent the night in Wal-Mart parking lots. A quick sink-shower in the morning is a nice way to start the day. Truck stops and rest areas are another great place to sleep. The downside of rest areas is that they are almost entirely located off of a busy highway. This doesn’t really bother me for sleeping but if you are taking a trip into small towns, chances are slim that you will be near a major highway. Usually these places have at least bathrooms. A lot of truck stops have showers available. Some say for truckers only. Be respectful, act like you know what you are doing, and shower up in the morning. Truck stops and rest areas can have a bad reputation. I personally have never witnessed anything real shady going on at any of these places, at least no more than at your local gas station. Use your head, pay attention to your surroundings, be respectful, and there will be no issues. Motel/Hotel parking lots. I’ve spent many night crashed out in a car or truck in a hotel parking lot. Most hotels require guests to register their vehicle when they check in. I have never seen or even heard of anyone getting towed that wasn’t on the registered list. I’ve never been hassled or had anyone approach me while spending the night in a hotel lot. I like to choose smaller motels that are a franchised chain with independent ownership. A single location hotel/motel would be my second choice. Large and fancy hotels are a far third place. The reason for this is not parking or sleeping, as the sleeping situation could be better at a large hotel. The reason is for a shower in the AM and possibly some continental breakfast! If you see the cleaning service going from room to room, ask if you can shower in a room they haven’t cleaned yet. Success will depend on how sketchy looking you are, how the hotel/motel is managed, and various other factors. I personally like to ask the front desk person if there is a room I can shower in. Most that I have been to have let me shower for free. Sometimes they want to charge for a half day or hourly rate. If you are personable and friendly, a lot of times you can chat it up with the desk person and possibly work in some free breakfast. It all depends on how social and friendly everyone is. Behind strip malls and in industrial parks. If I want someplace quiet, this is where I usually head to. I tend to look for places that have a small fleet of vehicles that they keep parked behind their business. A lot of times an employee will take a company vehicle home and leave their car in the lineup or parking area behind the business. This means that you can also park there and not draw attention. It will not look out of place to anyone who sees a random truck parked out back. Most of these places have multiple tenants in one building so if someone does see you pull in on a security camera or is in the building when you arrive, they will assume you are with another business there. With security cameras mentioned, I like to stay away from anyplace with a security camera. It just adds to the hassle if someone does happen to be watching and realize you are camping there. They might come by and ask you to move along. Keep in mind to obey any no trespassing or private property signs. Do not do anything illegal and please be respectful of the property you are on. Behind restaurants or other locally owned businesses. This can require some work but can be worth it. When I find a business or restaurant on a really beautiful piece of property, maybe with a parking lot behind it that overlooks the ocean or something similar, I have found it worthwhile to eat or shop there, and after you are finished, ask the owner if it would be possible for you to sleep overnight out back. Again, being friendly, outgoing, and not looking like a weirdo will help a lot here. I usually explain the nature of my trip and explain that I am 100% self contained. I will not be making a mess or setting up fires or anything like that. I will simply be asleep in the back of my truck until I wake up early the next day. Many times they agree right away and will even offer access to a hose for drinking water, point out spots to go to the bathroom, or give you access to an outside accessible bathroom, it all depends on what they have available. This can be hit or miss but sometimes the payoff is worth it. Boat launches. I have had a great success rate with staying at boat launches. Boat launches have a ton of great benefits. Most are set back from any main roads and are fairly secluded. This offers a lot of privacy and no background noise. One of the best things about a boat launch is that they typically offer a great view of some type of water feature for some added scenic value. It is always nice to wake up to a great sunrise over the water (find one facing East for best results). It isn’t unusual to see a vehicle parked in a boat launch overnight either. Many times people will meet up with friends to go for a ride or just to move a boat in and out of the water. Trailheads for long (multi-day) hikes. It is pretty common for hikers to park at the trailhead of a long hike, spend a couple of days hiking, and then come back for their car. Pay attention to any signs though. Many areas have signs expressly prohibiting camping or overnight stays. These are good spots because usually there is no traffic and you have the spot to yourself at night. Nobody starts a hike when it is dark. The cars in the parking lot that are left overnight usually belong to hikers and anyone patrolling the lot will be used to seeing cars with sleeping bags, blankets, stoves, and any other random stuff you have lying around inside your vehicle. You won’t draw any attention, even if cooking a meal outside your truck. You will look like you are just another hiker. Again, be respectful of the property. Don’t set up an expansive camp and make a mess. Keep your profile and footprint low and these places will remain open. Ask police. This can be hit or miss and you have to be prepared to not stay in the town if you ask. If you run into police on the streets it can be worth your time to explain to them the nature of your trip and say that you are looking for free places to spend the night. Again I explain that I don’t need facilities or anything. I just need a safe and nice spot to crawl into the back of my truck and sleep. It helps if you are near your rig for this conversation as it adds credibility to your story. They will either tell you that you are not welcome to do that in their town, that they don’t know of any good places and will suggest a paid campground, or they will give you a good spot to go. The benefit of this is that they will give you a safe spot and they have your back. They will typically do a drive around of your spot a couple of times at night. They won’t bother you but they will make sure you are safe because they gave the tip. It really helps to define the exact type of spot you are looking for. If you just say a place to camp, they will suggest a paid campground and nothing more. You need to break the mold of what “camping” is and then suggestions will come. I am one of those people that really likes to shower every day. When camping I can easily switch to every other day and still be happy. More than that and I start to get uncomfortable. A hot shower is a nice amenity to have on a long trip and can really refresh your energy levels, as well as make you more tolerable to your co-pilot and any people you may encounter. Showers while free camping can be kind of a hard thing to come by. An easy way around this problem is by having a shower with you. Sometimes that isn’t practical or necessary though and after years of camping and outdoors travel, I still get by just fine without one. A gym or health club. I like to choose small, locally owned establishments. Your success rate for this will be entirely based on the management at the gym and your social skills. I managed a gym in Minnesota and if someone came to me asking for a shower, I would charge them the day pass fee of $10. This is almost entirely because of liability issues. If they slipped and fell in the shower and I didn’t have a waiver and pass for them, that would not be a good day. If I trusted the person and I saw them roll up on a well traveled and beaten BMW GS Adventure fully loaded with out of country plates, I would almost certainly give a “discount” on the day pass to get the price down to $1, have them sign the forms, and a shower, hot tub, everything is theirs. It all depends on the attitude of who is working the desk, what their management has to say about it, if upper management is around, and how you present yourself. You can also look into a membership at a national chain or a chain that has a lot of gyms in the area you will be traveling. Check into exactly what you are signing and make sure there are no signup or cancellation fees, but for $20/month you can get access to a number of 24 hour gyms where you can roll up anytime you want for a shower or even a hot tub soak. Truck stops. Flying J is a great truck stop with showers and plenty of other amenities. Unfortunately we don’t have many of them in NH. Be prepared to pay a small fee for a shower at some truck stops and be courteous of truckers. They have a job to do and wont appreciate you getting in their way. Campgrounds. A lot of campgrounds will let you shower for a VERY nominal fee, even if you don’t stay the night. Some will even let you shower for free. Call ahead and ask or stop in. You will have better luck with a free shower by just stopping in, but it is a risk. Over the phone they will always quote a price because they don’t know who you are, what you are doing, or anything about you. A face to face exchange allows them to make a personal judgment call on doing you a favor. Make friends! Often times on the road you meet people at a restaurant or gas station or store. If they seem nice and trustworthy, explain that you could really use a shower. You can also look into sites like couchsurfing.com for a night at a house and a warm shower. Natural showering. Take some bio-degradable soap with you and swim in a lake, pond, or even find a nice waterfall. The water may be cold but it will also be refreshing. This obviously only works at certain times of the year! 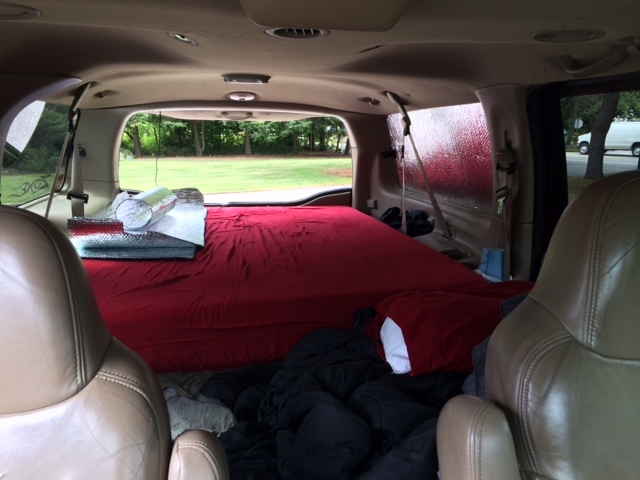 There really aren’t too many necessary modifications for sleeping in your vehicle. It all depends on what comfort level you require. I’ve slept in the passenger seat of a two seater Mercedes convertible (not recommended) and I lived through it. A sleeping platform with a 6″ foam mattress, blankets, and a good pillow is almost as nice as being at home. It all depends on how many nights you plan to stay and your preferences. Bug screen for windows. In the summer it can be too hot to roll up your windows all the way. This can lead to acquiring a large mosquito or bug population inside your vehicle. A cheap and easy solution is to head to Home Depot or Lowes and pick up a roll of fiberglass screen door material. Cut a square of it to be just larger than the width of your door (yes, the door, not just the window) and about double your windows’ height. With the door open, drape the screen over the top of the door and out both sides. Close the door on the screen so that it sticks out the door on the top and both sides. Viola! You are now bug free. Yes there is a gap at the bottom of the screen, inside the vehicle, but just roll it up or tuck it into the handle as best you can. I haven’t had an issue with this method but it is the cheap, easy, and quick way of doing things. You could step it up a notch with cutting it to size and using glue on magnets to seal against the outside. Blankets or Reflectix for blocking windows. My truck is tall enough and my back windows are tinted enough that you can’t really see inside when I am parked for the night. In my Land Rover DII I didn’t have a platform so I was well below the windows when I slept. 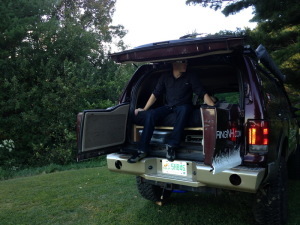 This meant that people couldn’t really tell I was in there unless they were actively looking inside my truck (which no one ever did). Take a look next time you are in a parking lot at night and see just how hard it is to make out details inside of people’s cars. It’s not easy. With this said, you may want a little more privacy. I know that when on extended trips sometimes I like to watch a tv show or movie or work on the computer. With the computer screen on, it lights up the inside of the truck and allows people to see in. You may also want to be able to turn the light on to change clothes or find things and not want the attention. You may also want a little more insulation from the cold or if you want to nap during the day you may want to make it darker. You can pick up some cheap fabric from Jo-Ann Fabrics or some cheap fleece blankets from places like Wal-Mart and Target. These blankets can be tied to grab handles, seat belts, tucked into seams in the interior molding, or a variety of other attachment methods to allow you to block out the windows. One modification I made that I love is a cut set of Reflectix panels, one for each window. They roll up for travel and all I have to do is unroll them and pressure fit them into the windows when I park. It takes about 2 minutes and provides 100% privacy. This has the drawback of possibly making it look like you are camping or something is going on in the back of the truck if someone notices the shiny panels in the windows. So far it hasn’t been an issue for me. In keeping with the theme of making my truck not stick out and making it look like it is just parked for the night, I leave my front two windows and windshield unblocked. I hang a black blanket directly behind the driver and passenger seat. The front windows are not tinted and when someone looks, they can see it is just an empty truck, parked for the night. You can’t really make out details inside at night so the blanket behind the seats isn’t seen. It just looks dark. 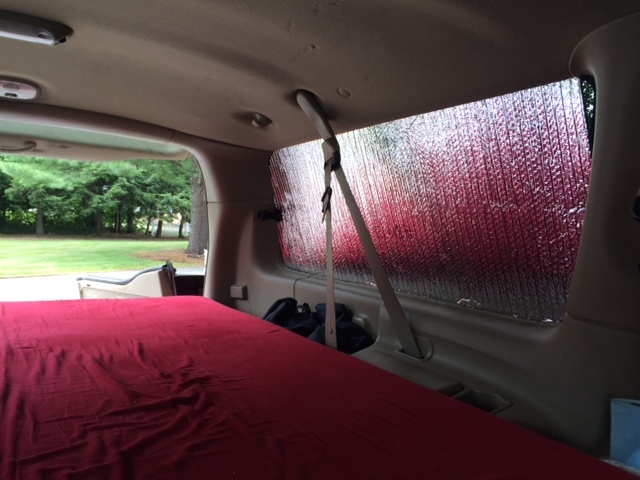 If all the windows were blocked, it makes it look like you are sleeping in your vehicle. The added benefit of Reflectix is a huge increase in heat retention in winter. If you install them during a hot and sunny summer day they also do a fantastic job of blocking the sun and keeping the truck much cooler. Water and soap. I like to keep a gallon of water in the truck for a quick hand/face wash or if I need a drink. Now you can get a super greasy steak and cheese sub for dinner, park someplace quiet, eat in peace, wash up, and go to bed without having to drive around or eat near a place with running water. Propane Stove. I carry a propane stove because it means I can cook dinner anywhere with no mess. While my favorite meals to cook are tinfoil dinners (put everything together in a tinfoil bowl, close it up, and toss it into the fire), having a campfire is not always a possibility. A charcoal grille is nice but too dirty and time consuming for me. Propane is quick, clean, non-smelly, and portable. No gas to spill, no black charcoal everywhere, and no scrambling for firewood.